This is your ultimate marriage and money guide so that you can build financial intimacy with your spouse and partner. When it comes to money, do you and your partner gel like PB&J, or mesh about as good as oil and water? Perhaps you don't even know because you refuse to talk about money altogether. What you DO know is that scary statistic that gets spread around in hushed tones – that the leading reason why people divorce is over money, that how people fight is a good indicator about whether or not they’ll divorce, and anything else having to do with the “d” word. It's not you, and it's not your partner. Money problems in marriage come from dealing with a limited resource between two people. We each come into a relationship with different money expectations, different money behaviors, and basically different everything's when it comes to cash. But this doesn't mean you'll forever crave what I like to call financial intimacy instead of basking in it. Financial Intimacy: Being able to work together and share your thoughts, feelings, needs, and desires about money with your partner in a safe space where you feel you are being heard and your needs are being reasonably met. Working together, stopping the cycle of sabotage, complementing each other’s' weaknesses and capitalizing on strengths, are all amazing benefits of couple-hood that can be yours. This guide is not meant to be theory only. Your “financial counseling for couples” starts here. I want you + your partner to use the information below to take action, start working together, and grow your financial intimacy. For the first two years of our marriage, my husband and I had trouble talking about money. And “trouble” is putting it lightly. While I was super-excited to talk about the subject, eagerly approaching him every chance that I got (finally, I thought, someone I can relentlessly money-goal with! ), my husband, Paul, was quite standoffish about the whole thing. The more I tried to talk to him about money, the uneasier he became. It got to a point where my stomach would knot up when I knew I needed to air some financial laundry, and he would shut down altogether. It took us awhile to finally break the money ice in our household. And guess what? As with everything in a relationship, the awesome results and amazing financial intimacy we enjoy now came about because both of us exercised give and take. The number one thing you both need to realize – and the sooner you do, the easier things will be for you – is that you are in this together. For many couples, money is a taboo subject nestled away in the “have-to-but-don't-want-to-do” department. And if it's not taboo, then it is at the very least uncomfortable, stress-inducing, and a matrix of compromises when another person is involved. What types of money conversations you need to have with your partner depends largely on where you’re at in the relationship. Dating Money Conversations: Just in the early stages of dating someone? You certainly don’t want to scare them off with deeply personal finance questions. But you can take this time to gain insights into their life values, money priorities, and living situation. Do they have kids that they’re happy to financially provide for? What does their living situation look like (are they still living with parents, and what are their plans moving forward)? Keep your eyes and ears open. Living together Money Conversations: While you don’t want to pry into each other’s finances – you’re not engaged, after all – you do need to know how to split finances when living together and whether or not the person in charge of paying part of your bills can actually afford it. Also, getting an apartment or home together means your credit scores are likely going to matter. So, it’s a good opportunity to have each of you download your credit reports, and to go over them together. Engaged Money Conversations: Congratulations – you’re now going to tie your lives together. And money is a big part of that, whether you decide to keep finances “separate” or handle them jointly. 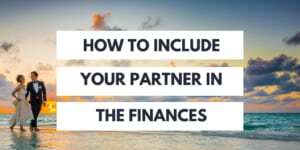 Some of the conversations you need to cover include finding out each other’s debts, financial obligations, expectations for how to handle finances moving forward as a newlywed couple, income levels, credit scores. If you’re going to marry this person, then you deserve to know their financial history and inclinations (and they deserve to know yours!). Newlywed Money Conversations: Here you want to focus on whether or not you’ll combine accounts, keep things separate, spending thresholds, how to file your taxes, what new insurance coverages you’ll need to protect your family, couple money goals, which health insurance plan to go with (if you both work), who takes on which financial roles in the household, changing beneficiaries on financial accounts to reflect the change in your life, etc. Married Money Conversations: At this stage in the game, you need to take a deep dive into your retirement plans + hopes + current status of your retirement accounts. What kind of retirement do each of you want, and what will that cost? What kind of lifestyle do the two of you want to lead, and what financial changes will you need to make to make that happen (such as one of you staying home with a child to raise them, or career switches, or someone wanting to start a business, etc.)? What are your individual goals you have in life, and what are your couples goals? How does your current money track look in terms of achieving these goals? Is your estate planning in check? Have you updated your beneficiaries to reflect your wishes and current life circumstances? Remember these Rules of Engagement for discussing marriage and finances. They're the same ones that we’ve adopted in our own household. They’ll help the two of you around this sometimes-touchy subject. Just because one person doesn't speak up doesn't mean they don't have opinions about how the finances should be run, or that those opinions should not be valued. They might just not know how to express themselves! But don’t fret if that list above makes you super-nervous. I’ve got a solution to those awkward money conversations! Pssst: money conversations not flowing too well between the two of you? Here's one way to help you with how to talk to your partner about money. Listen, money or financial meetings with your spouse or anyone else is just not fun. Well, unless you’re a money nerd like myself. So, you’ve got to ADD the fun into those meetings to make them something you look forward to instead of dread. In fact, don’t call them a Financial Meeting. Call them a Money Quickie! That’ll get your partner MUCH more interested in the whole process. Discuss new topics you've yet to broach as a couple: Use the list above as a rough guideline. Discuss money maintenance issues: This can include things like updates to categories like the monthly expenses, savings goal, debt payoff goal, etc. Bonus Objective: Build intimacy through a fun experience. The bonus part? Well, that’s where you’re going to build both your financial AND emotional intimacy in your marriage. I’ve got some really great, cheap, ideas for you whether you can escape out on the town or are in the phase of your lives where at-home dates are the ones that work (that’s where we’re at!). 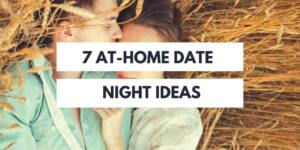 At home date night ideas for married couples (these ideas don’t include a television!). One of our favorite creative date Ideas for you – setting up a culinary trail date. Things to do on date night with your spouse. The 5 best at home date nights we’ve had since our baby came on the scene. Have fun with this! In fact, take turns setting up the “bonus” part to your money quickie meeting. After you actually start talking money in at least a semi-comfortable manner with your partner, it’s time to figure out the foundation to your Couple Money System. There are 3 couple money systems you can choose to set up, and of course tons of variation within each system. Combined Finances: You’ll have a joint checking account, joint savings account(s), plus a way for each person to spend/access these accounts. Separate Finances: Two separate checking accounts, two separate savings account(s), set up expectations of who will pay what bills. Let’s be real for a second here though – you cannot keep your finances completely separate from one another if you’re living together, engaged, or married. Even if you keep everything physically separated, your financial life is now somewhat tied to this person, even if just this person’s ability to hold a job and pay their share of the rent. Keep this in mind! Hybrid Combined + Separate Finances: This looks like some combination of joint/separate checking accounts, and joint/separate savings accounts, with each person have equal access to the joint accounts. Along with actual money talks with your partner, reading through your options should help you figure out should married couples have joint bank accounts, or should married couples have separate bank accounts. In the process of figuring this out, you’ll want to combine certain accounts and get rid of others that are duplicates. Hint: weed out the accounts that have the higher fees, or pay the least amount of interest. Bonus tip: Start from a clean slate and do a search for bank account opening bonus offers + the highest interest rates you can find when setting up your couple money system. Might as well, right? Yes, there is something to be learned about finances from the movie Top Gun. Like F-14s, finances can be so complicated to maneuver that two people are better than one. Part of managing money as a couple is figuring out who is going to be responsible for which money roles in your household. However, you might have tasks that no one is claiming as their role, or tasks where there is an equally troubling problem – two pilots butting heads. I like to take couples through an exercise where they individually fill out whether they’re the Maverick or the Goose on 10 different money roles, and then they compare answers. After that, they need to hash out who will take the lead for each role – be the Maverick – and who will be the wingman, Goose. Note: even if you’re the wingman? You need to at least be kept updated about a role. No “head-in-the-sand” partners here! Investment Overseer (pssst: the person in charge of investments? I’ve got a cheat strategy for you. Sign up for a free Personal capital account and you’ll get these awesome snapshots of your financial situation, including all of the investment fees you’re paying, your risk allocations, etc.). Remember, take advantage of one of the best perks with couples' finances: choose the person most capable of completing each task. You want efficiency wherever you can. If you are both weak in an area – say, investments – then discuss whether or not to bring in some outside help (like an investment or financial advisor). You could choose to read a book together on the subject or figure out some other way to make up for the collective lack of knowledge and know-how (there's nothing wrong with it, unless you choose to do nothing about it). Keeping track of your money, assets, and net worth can be challenging for one person, let alone two! 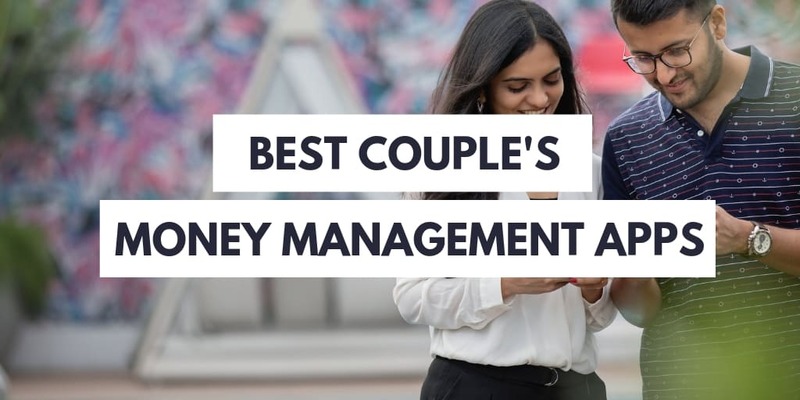 Fortunately, there are some great couple money management apps out there to work with (find the best couple's money management apps here). Honeydue: This is a couple money management app that will help you both get on the same page about finances. You can choose which accounts you want to share between the two of you, as well as if you want to share account balances only or give access to the individual transaction information as well. So, this is an ideal app for using any of the core couple money management systems discussed above. There’s even a bill-reminder feature you can set up for the person who is in charge of paying bills manually. There’s also a special “what’s this charge” feature where if you find a transaction you want to know more about, you can send it to your partner to find out what it was for. Personal Capital: This app is perfect for the person in charge of investments and will give the two of you an overall snapshot of your financial picture whenever you’d like it. It also has some good features for couples managing their money together. When my husband and I first got engaged, we had a revealing money talk with each other. I say revealing, because it was on the agenda to reveal each other’s finances – income, debts, etc. It turns out that together – we decided to combine finances – we were $25,000 in debt. We were going to get married about 9 months later, and decided that our Number #1 couple money goal was to get all of this debt paid off before going down the aisle. Did I mention that we also wanted to buy a home together, and pay for our wedding, without going any FURTHER into debt? The fact is, setting our lofty couple money goal not only made it much more likely that we would meet it – and we did, though it was 4 months after our wedding that we declared ourselves debt-free except for the mortgage – but it brought us much closer together. It fostered amazing financial intimacy + emotional intimacy that we probably would not have gotten had we not done this. Combining finances and debts and paying them off together is not for everyone. BUT, what can be for every couple, is coming up with a singular couple money goal that you both can work towards. The final topic I’m going to briefly cover? 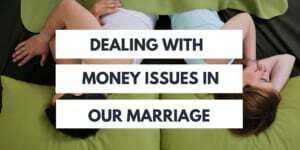 Are dealing with money issues in marriage. You’ve opened up the money dialogue, set up your core couples money system, and divided up the roles you want each other to assume to maximize each other’s’ strengths and minimize the weaknesses. Maybe you’ve even come up with a couple money goal. Even after having all that in place, I do need to tell you that most marriages will deal with money issues at some point. Heck, even we did! My husband and I had financial friction(aka, money issues in our marriage) for a few years (spoiler alert, we learned how to deal with it successfully with a unique technique you can read about). Yikes. That’s quite a list! I’ve got a few suggestions for how to proceed with these tricky topics/situations. Please take them with a grain of salt; they need to be the right suggestions for YOUR situation, and only you can know if they are. Have the Difficult Money Conversation: Your first option of dealing with the money issue is having an honest conversation with your partner. Do it when you’re not boiling mad about something in particular. Write out a list of the things you want to cover, and be open to the fact that your partner may have things that have been irking them about your money lives together as well. Perhaps you don’t know the full story, and now would be an opportunity to hear it from them. Use one of your Money Quickies to broach whatever it is that is bothering you. Try to remain nonjudgmental, and use “I” statements as often as you can (such as “I feel”, and “I think”, instead of the blaming “you” statements). Seek a Compromise Solution to the Problem: You’re in this partnership together, and so no one person can get their way the entire time. That’s not a true partnership, and will create resentment. Instead, look for a win-win compromise solution where you’re both giving some, and both receiving some. This could be increasing a spending threshold beyond your comfort level but that your budget can still sustain to make the other person happier. Maybe it’s letting your partner choose your next savings goal, with the idea that you get to choose the one after that (if you both can’t decide on the same one). Seek Outside Mediation: Depending on the severity of the situation, you may need to seek an outside person to mediate conversation between you and your partner. Financial counseling for couples is another option, and could do a world of good. Financially Limit Your Partner: If you’re dealing with financial dishonesty in marriage, I’m throwing this option out there for you. But realize that it is a severe option, and should only be used in severe situations.